US Dedicated Review 2019: Is US Dedicated a Good Hosting? 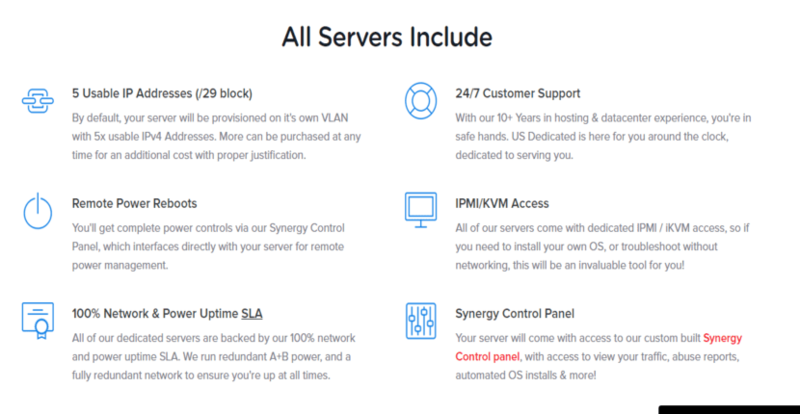 Founded in 2013, US Dedicated provides VPS, dedicated servers, colocation, and private cloud services to businesses in need of high-volume web hosting solutions. They operate servers in six locations and offer value-added services with a 100% uptime SLA and free add-ons like on-premise DDoS protection. US Dedicated was founded in 2013 to give customers peace of mind through seamless service, uptime, and support. They’ve done that over the years by delivering high-quality dedicated servers, cloud hosting, and colocation solutions with servers in six states across the United States. In addition, all their servers come with free on-site DDoS protection from Corero. Rather than setting up a separate detection system that leaves your servers vulnerable for a brief period before the incoming attacks are recognized, each of their 10Gbps ports are passed through a Corero Smartwall Appliance capable of filtering out a 10Gbps line-rate DDoS attack. This ensures that your server defenses are always up and that there’s no downtime even at the beginning stages of a dreaded DDoS attack. You also get enterprise SSDs in all servers and premium INAP Bandwidth to ensure stability and speed for your website. It’s clear from their high-volume services that their offerings are not for beginners or small business websites. This is the only con I have noticed so far. They won’t fit personal or small businesses because they don’t provide shared servers. In addition to these features, the VPS runs on RAID-10 SSD configurations, ensuring that your data remains safe and highly available. I especially like the control panel offered, Solus Virtual Manager (SolusVM). This gives you a one-click installer for a good number of operating systems, including Ubuntu, Fedora, Debian, and FreeBSD. SolusVM also gives you control over multiple servers on one pane. Plus, whatever you adjust on the panel is instantly deployed. On the Private Cloud front, US Dedicated offers support for a variety of cloud technologies, including Azure, AWS, Hyper-V, Citrix Cloud, Apache CloudStack, and Dell EMC. This is great if you want the customizability along with the added stability of a secure cloud server provided by Microsoft, Amazon, or any of the other providers. The VPS hosting plans provided by US Dedicated are inexpensive for what you’re getting. In fact, the prices of these premium solutions are almost the same as those of some shared hosting plans offered by other providers. You can also opt for fewer features for a much lower price with OpenVZ VPS plans. The dedicated, colocation, and private cloud solutions are not as cheap. The costs do add up to quite a bit, but you get what you pay for, and you can customize what you get to your budget. The hardware and software provided make them a worthwhile consideration for high-end web hosting solutions. Although you cannot contact their support staff via phone 24/7, their online ticket system works around the clock. Ticket support is incredibly fast. When I contacted them, my issues were addressed within five minutes. US Dedicated provides higher-end hosting for medium-sized or enterprise-scale businesses. They offer robust benefits at standard industry prices, with their VPS being less costly than expected. Wondering how US Dedicated stacks up against other Web Hosting companies? Enter any other Web Hosting company and we will give you a side-by-side comparison.